Home Hotels New South Wales Mercure Sydney Nautilus Resort Queensland Binna Burra Lodge Kondari Resort Lady Elliot Rydges Capricorn Daydream Island Castaways Rydges Reef Resort Palm Royale Red Centre The Lost Camel Kings Canyon Resort Red Centre resort Glen Helen Homestead Territory Inn Tasmania The Lodge on Elisabeth Top End El Dorado Motor Inn Mercure Inn Katherine Gagudju Lodge Cooinda Kakadu resort Frontier Darwin Victoria Bothfeet Lodge Batmans Hill The first hotel on our road. It really seems to be nice, but we experienced pooring rain and unless you're local you won't enjoy it. 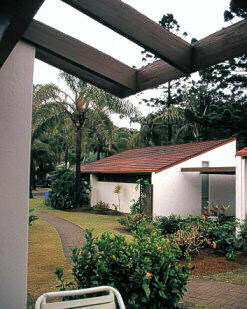 But there are nice bungalows in a park, several pools and the beach, a barbeque place and tennis courts. In my room I found a large pile of adverts for the sights around. Looks like they are well prepared for a longer family holiday.